Teaching/Research - JASON A. LAKER, PH.D. In this thick, complex, and rigorous context, bricoleurs in the social, cultural, psychological, and educational domains operate with a sophisticated understanding of the nature of knowledge. To be well prepared, bricoleurs must realize that knowledge is always in process, developing, culturally specific, and power-inscribed. They are attuned to dynamic relationships connecting individuals, their contexts, and their activities instead of focusing on these separate entities in isolation from one another. They concentrate on social activity systems and larger cultural processes and the ways individuals engage or are engaged by them. Jason has been collaborating with Dr. Erica Boas on a research program relating to sexual consent among college students. The project's formal academic title is "Sexual Coercion and Violence in College: Reforming Policies and Practices for Consent Education and Personal Agency," and its common title is Consent Stories™. This research aims to understand and increase students' capacities for personal agency, and to reduce coercive and non-consensual sexual encounters. Jason and Erica completed their pilot study, following a cohort of first year college students during the 2012-13 academic year. Several of the participants were re-interviewed during their fourth year (2015-16), providing compelling and poignant insights into their development over time (see more here). The current phase of this research involves interviewing students who identify as Lesbian, Gay, Bisexual, Queer, and Trans*, and/or who practice Kink. They presented some of their initial findings at several national conferences, including SCOPE, AERA, ACPA, University of California at Berkeley's Center for Studies in Higher Education, and at the ISA World Congress in Yokohama, Japan. This project was referenced in the New York Times (see article here). 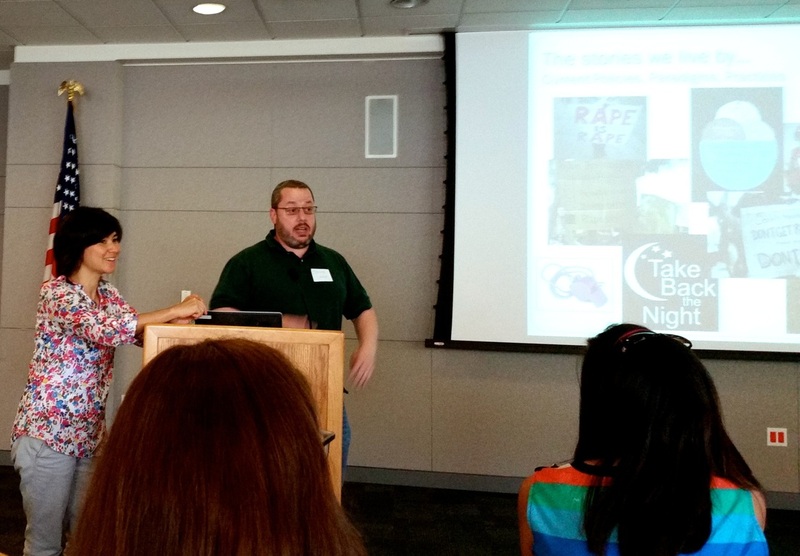 They recently delivered the opening keynote talk about their project at the ACPA/NASPA Joint Conference on College Men (which Jason founded in 2007). Jason and Erica have begun conducting training and professional development workshops for college and university faculty, staff and administrative leaders in order to enhance institutional effectiveness in sexual assault prevention and response efforts. For more information or possible consulting engagements, complete the contact form on the Contact/Booking page or see our new project website: www.consentstories.org. Jason with Minna Holopainen (Communication Studies, SJSU). 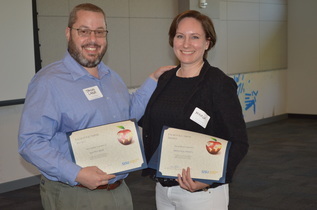 Together, they received a Faculty Award for Excellence from SJSU's Center for Community Learning & Leadership for their Reciprocal Pedagogy collaboration. Jason is continuing his work examining and applying the integration of mindfulness concepts and practices in graduate Counselor Education courses and how this influences students' experiences, learning and professional dispositions. He is also implementing an Experiential and Service-Learning approach called "Reciprocal Pedagogy" in which graduate and undergraduate college courses are linked to enhance the socio-developmental learning experiences of the students in each. In 2012, he presented this technique at a conference on General Education in Hong Kong. Jason co-leads an annual study-abroad trip to Costa Rica for graduate students with department colleague, Dr. Dolores Mena. This program is a collaboration with the U.N.-Mandated University for Peace in San José, Republic of Costa Rica. In this photo, Jason is leading a reflection and mindfulness meditation for students following a session about Appreciative Inquiry and Leadership taught by friend/colleague/genius, Mohit Mukherjee, Faculty member and Director of the UPEACE Centre for Executive Education. Jason studied Broadcasting and Cinematic Arts during his undergraduate education and still finds this medium to be compelling and useful for ed﻿ucation and commu﻿nity building. He has produced four educational videos relating to his research on men's identity development. His first, produced in 1997 while working at the University of Delaware, features interview segments with his friend, mentor and Men's Studies Scholar, Dr. Harry Brod, who passed away in 2017. That video, posted below, focuses on themes in men's friendships. It is striking how the themes remain current over 20 years later. The stereotypes of masculinity and disability are often in opposition, so it is intriguing to consider how the two might operate in relation to each other within an individual. Examining social identities at their intersections and margins can inform our understanding about particular ones, and about identities and culture more generally. Jason produced two educational video documentaries in which men with physical disabilities discussed their stories and perspectives. This is the second one, focusing on the men's relationships with other people in their lives, particularly in terms of how their disabilities influence them.